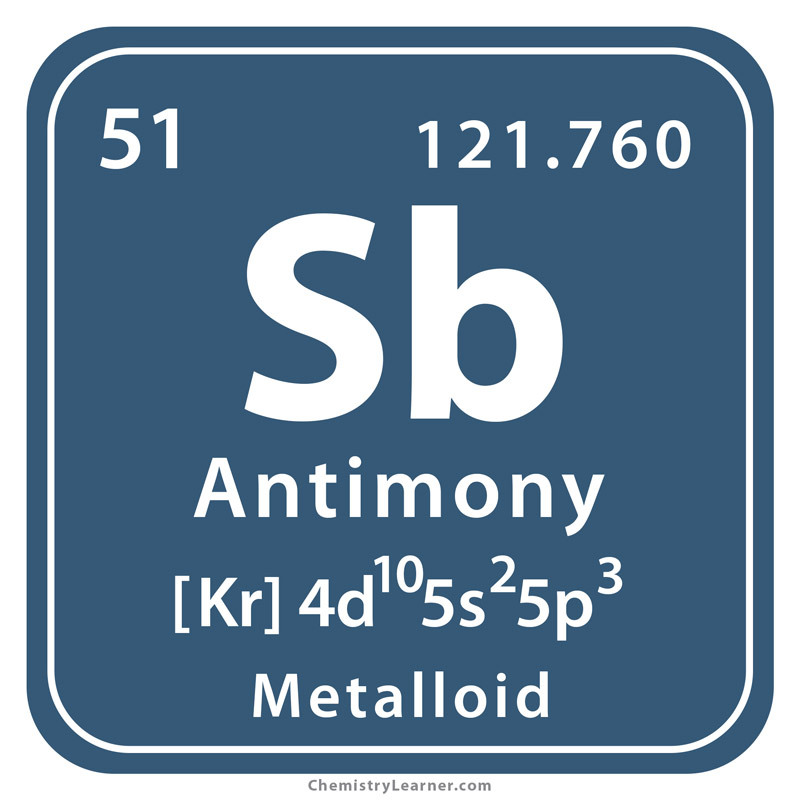 Antimony (pronunciation: AN-te-MOH-nee) is a lustrous metallic element that belongs to the family of metalloids and is represented by the chemical symbol Sb [1, 2, 3]. 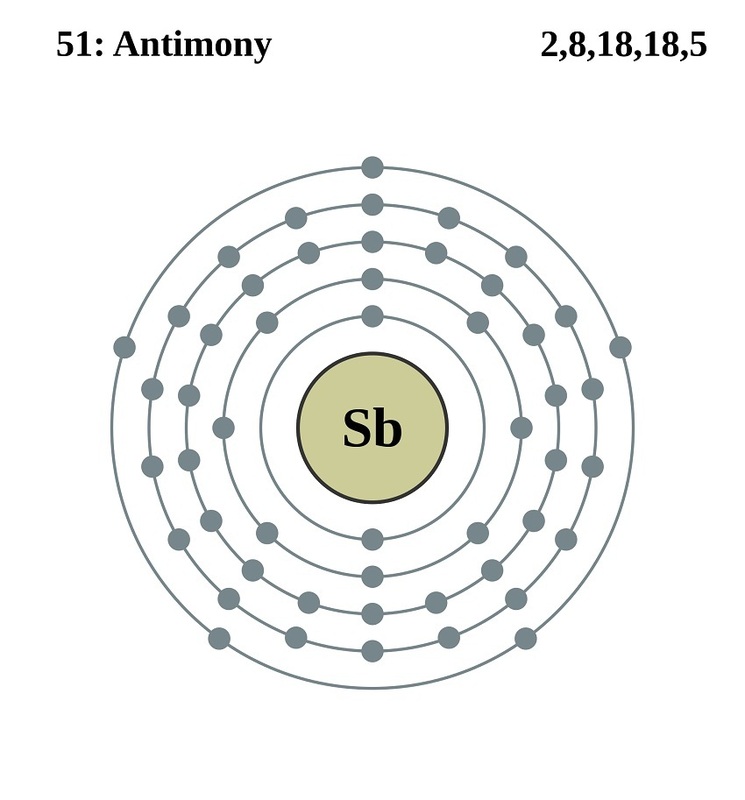 There are two stable isotopes of antimony, including 121Sb and 123Sb with a natural abundance of 57.21% and 42.79% respectively . It also has 35 artificially-produced radioactive isotopes, out of which the longest-lived are 125Sb, 124Sb, and 126Sb with half-lives of 2.75856 years, 60.2 days, and 12.35 days respectively . 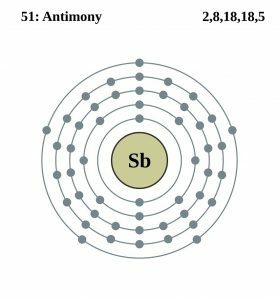 Antimony occurs naturally in trace amounts in more than 100 types of mineral ores, mainly from antimony (III) sulfide (stibnite) [1, 5]. It is commercially obtained by roasting antimony trisulfide to form antimony oxide and then reducing it with carbon . 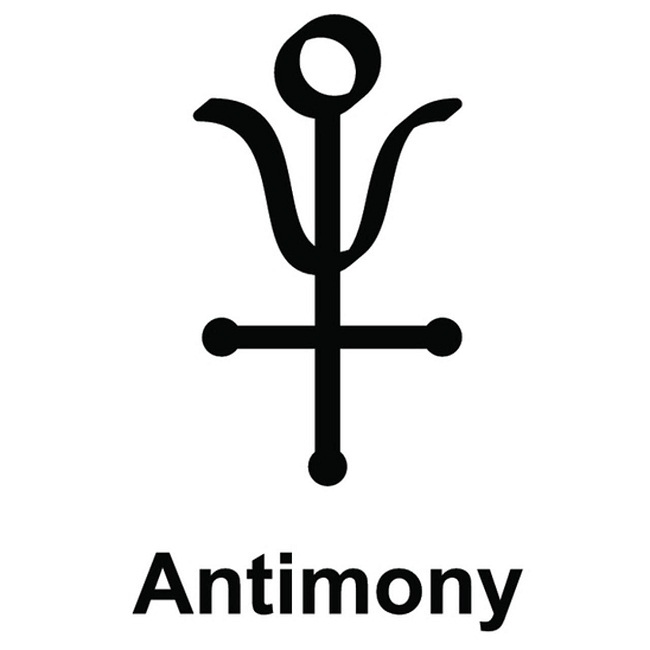 Antimony is also found in its native form . China, Bolivia, and Tajikistan are the top 3 producers while China, Russia, and Bolivia have the largest antimony reserves in the world . Origin of its Name: The name is derived from ‘anti-monos’, a Greek word that means “opposed to solitude” or “against solitude” [1, 6]. Who discovered it: Since a 5000-year-old vase made of pure antimony is shown in the Louvre museum, the element was probably found by the ancient people thousands of years ago . 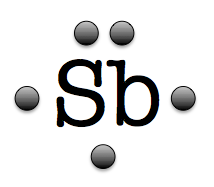 The early use of antimony sulfide (Sb2S3) has been recorded in an Egyptian papyrus dating back to 1600 BC . 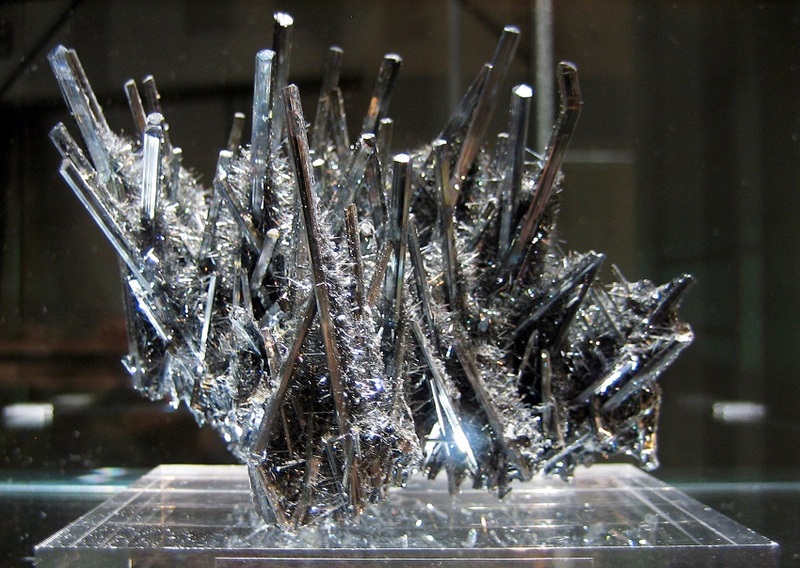 Its mineral ore, stibnite, was commonly used in its black form as mascara by the ancient people notably by the temptress Jezebel . Lead antimonate, a yellowish pigment was used by the Chaldean craftsmen during 600-500 BC . It was used in the thin coating of ornamental bricks found at Babylon made during the reign of Nebuchadnezzar from 604 to 561 BC . In the Medieval times, it was widely used for hardening lead while some were taken as a laxative . It is used for producing some semiconductor devices, including diodes and infrared detectors . 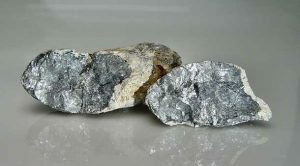 It is mixed with lead and other metals to form alloys that increase the metals’ strength, hardness, and durability [1, 3]. While antimony-lead alloy is commonly used in car batteries, antimony alloys are also used in cable sheathing, casting bullets, and making type characters in printing presses . 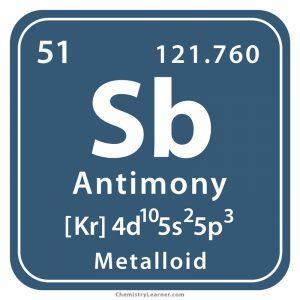 Compounds of antimony are used for manufacturing flame-resistant materials, paints, enamels, pottery and glass . An alloy of antimony, lead, tin, and copper, called Babbit metal, is used in making machinery bearings for its hardness and slipperiness . It occurs either during the treatment of parasitic diseases, including schistosomiasis and leishmaniasis or because of occupational exposure . 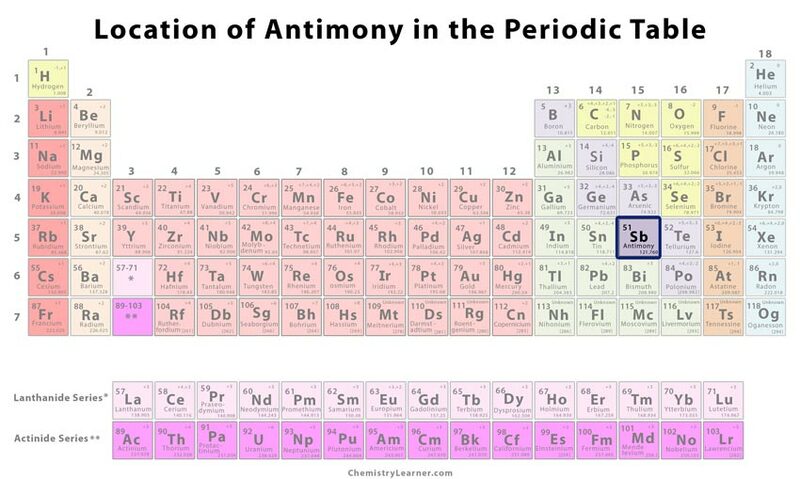 Also, antimony trioxide is considered to be carcinogenic to humans . Exposure to antimony compounds like antimony trisulfide, antimony tribromide, antimony pentasulfide, etc. may cause respiratory, gastrointestinal, cardiovascular, reproductive, and dermal effects . The stibnite crystals, resembling a group of swords and made from sulfur and antimony, were auctioned on 2nd June 2013 with an opening bidding price of $32,500 . The mineral, measuring 9 X 10 X 4 inches, was obtained from the Lushi Mine, China . 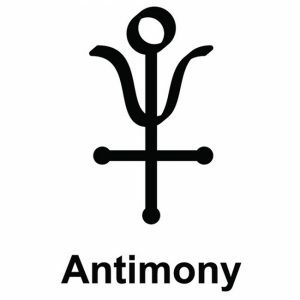 Antimony is graphically represented by the Eye of Horus, a symbol of royal power, good health, and protection from ancient Egypt . It also indicates the use of antimony sulfide as eye makeup . It is stable in air and water, being slightly oxidized by air and insoluble in water . In the pure form, it is neither ductile nor malleable like true metals . 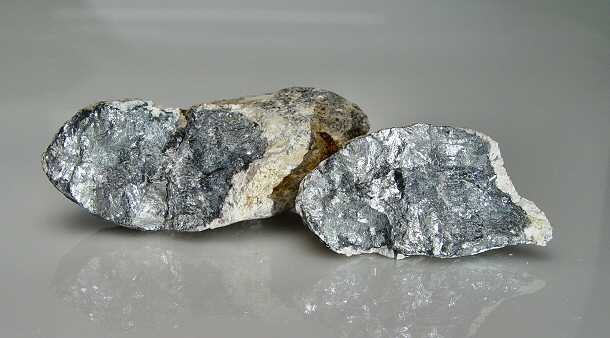 The cost of pure antimony is about $0.045 per gram, and in bulk, it costs about $0.0044 per gram . In July 2018, the average price of antimony per metric ton is $8,294 .